Be careful what you wish for! Sometimes the dream is far better than the reality, but it is the dream that drives our eponymous hero to plan and execute some drastic action. This R-rated dramedy is more drama than comedy; furthermore, if you have any trouble hearing dialogue, you might want to consider closed captions, either in a theater, or wait for the DVD. You don't want to miss the finer points in this plot. * Colin Firth ("A Single Man" and "The King's Speech") speaking American (! ), is Arthur Newman, a frustrated wanna-be golf pro who, after a down-hill slide, has decided to reinvent himself. "New man," get it? He cleverly fakes his own death and hits the road. * Anne Heche ("Cedar Rapids") is Mena, the girl he left behind. She knows he's boring, but she loves him anyway. * Lucas Hedges ("Moonrise Kingdom") is Grant, our hero's son. It turns out that he is the most compelling reason for Arthur Newman to re-think his decision. As our couple journeys on, they break into people's houses and take on the personalities (and clothes!) of the occupants. They are far more comfortable being someone else than being themselves. 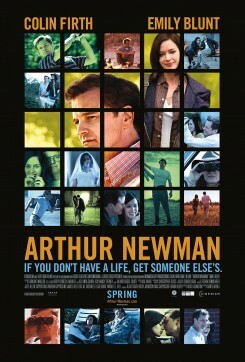 The tagline is: "If you don't have a life, get someone else's." They find this great...until it isn't.